C3 (Creative Community Committee) is a group of diverse representatives from Santa Cruz County. We tackle issues in our community together. It’s a leadership network for creative, action-oriented people who want to build a stronger, more connected Santa Cruz. In 2017, C3 worked together to create, Lost Childhoods, an art exhibition about foster youth, made with foster youth. The exhibition shared stories from local foster youth and invited our community to take action. In 2018-2019, C3 will help develop an exhibition about seniors facing increasing social isolation in Santa Cruz County. We’ll create this project through participatory brainstorming sessions that emphasize creative approaches to working together and dreaming up a better future for Santa Cruz County. This year, C3 will work together September 2018- March 2019, and then the exhibition will be open to the public from April 5th 2019 through September 22nd 2019. C3 is a project of the Santa Cruz Museum of Art & History (MAH). 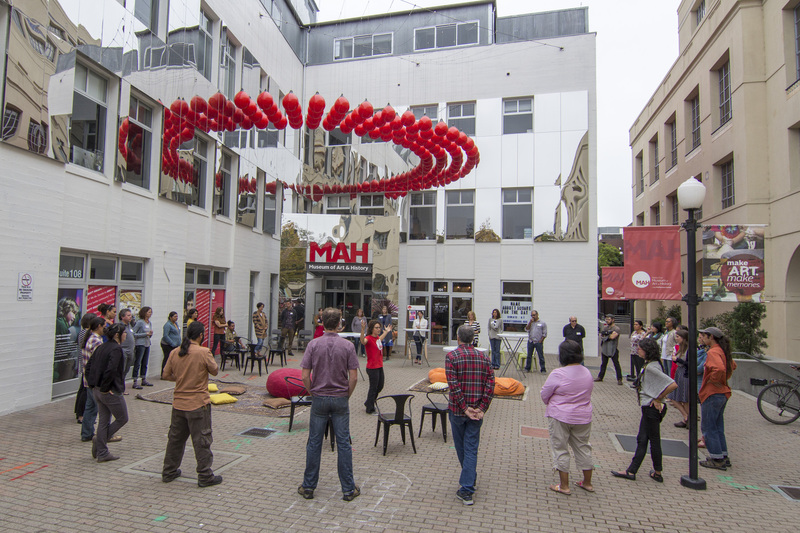 For us at the MAH, C3 is a way to infuse our exhibitions and programs with diverse perspectives, creative ideas, and relevant partnerships. Our community drives all of our work at the MAH. C3 is like jet fuel for us. That SC-MAH C~3 Jet Fuel is intoxicating! Thanks to Stacey Marie Garcia, Nina Simon, the MAH Youth interns & volunteers for making this first MIX! So excited to participate again in the C3 community, looking forward to more sharing, dialogue and collaboration!! 2nd thought: C3 is wonderful culturally creative people connected by MAH to embark on a most relevant, emotionally intelligent journey, an adventure about sharing-learning-thinking-creating-collaborating together on this worth-while potentially big-impact-ful project. Being fairly new to the SC arts community, I have felt such warm and helpful welcomes all around. The MAH was one of my first contacts and they set such an amazing example for the rest of their surroundings. My current position, at The Claraty Arts Project, has made it exciting to meet new people and create new awareness towards our artists who are living with mental and physical disabilities. Underrepresentation is a real thing and it has been my pleasure to help these artists make their way towards a better tomorrow!